This is the kind of cocktail you want when you are awake, but still cozy. It’s perfect for a lazy Sunday brunch. I used Aviation Gin because of its luscious lavender, robust cardamom and inviting orange notes that compliment the smooth, champagne like juice of Seckel pears. Combine all ingredients, except La Marca Prosecco in a beaker with ice. Stir well. Fine strain into a chilled coupe glass. 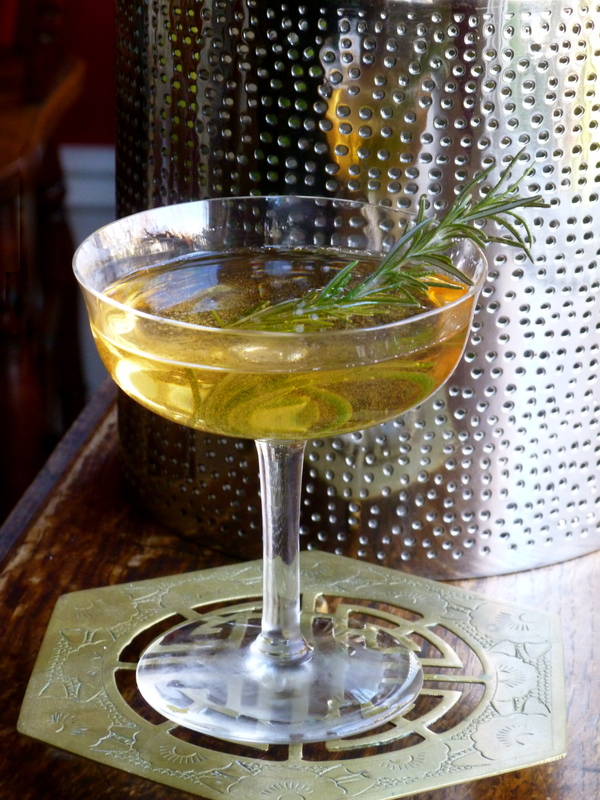 Top with Prosecco float and spring of fresh rosemary. Place eight Seckel pears cut in half into an airtight container. Add 750 ml Aviation Gin. Store in a cool place for two weeks. Shaking and taste testing once a day, everyday. Take out pears one by one with tongs. Fine strain gin though a coffee filer into another airtight container. Combine all ingredients in a small sauce pan. Bring up to a boil for a minute. Reduce heat to a simmer for ten minutes. Stir consistently until sugar is completely dissolved. Fine strain syrup into an airtight container, let cool completely, refrigerate.